Gail Aldwin is an award-winning writer of short fiction and poetry. 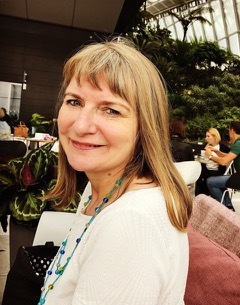 As Chair of the Dorset Writers’ Network she supports writers by connecting creative communities. She is a visiting tutor at Arts University Bournemouth and author of Paisley Shirt a collection of short fiction. This collection was long listed in the best short story category of the Saboteur Awards 2018. 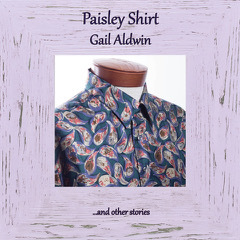 Paisley Shirt is a fascinating collection of twenty-seven stories that reveal the extraordinary nature of people and places. Through a variety of characters and voices, these stories lay bare the human experience and what t is like to live in our world. Thank you to Gail for joining us in conversation. We wish her all good things with the lovely Paisley Shirt and forthcoming novel. I started as a letter writer. In 1981, l left London to travel overland to Kathmandu on a double decker bus. We were stuck in France for three weeks waiting for visas to be issued so that we could cross Iran and then the adventure began. My mum stored all the letters I wrote in box files and later when I was studying to become a teacher, I used the anecdotes contained in the letters as a basis for short stories. The short stories turned into novels and eventually I began to write about imagined characters and situations. I now write novels, short fiction and poetry. I also co-write comedy sketches. I have important stories to tell about the human qualities of resilience and trust…and I enjoy being in a strong position to share these stories. I haven’t actively disliked any of my characters but some of their behaviours are appalling. I dig deep to find the vulnerability and frailty that causes my characters to make horrible mistakes. Some of these mistakes can be rectified while others compound to make the character burdened. My stories include issues such as domestic violence, alcoholism, homelessness and disability. I aim to create unique characters without stereotyping them. So long as I have a desk, a comfortable chair and a laptop, I’m happy to write anywhere. Sometimes idyllic locations cause more distraction from writing than my little room at home. I’d like to write as well as all the authors I admire but keep my own subject matter. There are many influential books so I can’t nail it down to one. My most recently read favourite novel is Out of Africa. Enjoy being part of a writing community through membership of writing groups and links on social media. Share resources and information about competitions and open submission windows. Celebrate your own successes and those of others. Appreciate the intrinsic satisfaction that comes from writing. I’m working on a novel called This Much I Know with a six-year-old narrator called Mikey. He responds to the friendly approaches made by a disabled church member because he is lonely. Mikey’s parents are suspicious of Leonard which leaves Mikey completely confused. The novel explores issues of trust and questions why it is becoming increasing difficult for adults to talk to children without raising concerns. At school I was made to read by learning phonics. This became nothing more than hard work and I never saw books as a source of interest. As a result, I didn’t read for pleasure until much later. When I became a teacher, I liked to share books that challenged and engaged children. One of my favourite characters is the protagonist in The Turbulent Term of Tyke Tyler but I can’t tell you why as that would spoil the surprise.